Oops - we don't appear to have a video for the fi-6000NS. The fi-6000NS is an integrated network scanner that simplifies and accelerates office tasks that involve ad-hoc scanning. The fi-6000NS is the world's first network scanner to come loaded with a large liquid-crystal touch display (8.4 inch XGA) and built-in keyboard (US101 type). 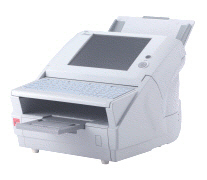 In addition to supporting easy usage, this touch display enables operators to verify fi-6000NS created image data prior to attaching it to an email or sending it as a FAX. Furthermore, the built-in keyboard facilitates smooth client computerfree operation.